Growing up, the signs were always there. Their pediatrician’s name was Dr. Cutler. Raised in Boston, Massachusetts, Derek Swanson sold knives from door-to-door. Ryan Swanson worked at Cheers Beacon Hill where the first knife he sharpened was a Dexter Russell, red handle, 10" chef knife. The brothers have apprenticed under Master Bladesmith Murray Carter and have honed over 50,000 knives by hand, using skills refined over time and legendary Japanese techniques created for samurai swords over a millenia ago. As professional edgesmiths, they practice a technique that engages the senses--the smell of oil and aged leather, the balance of blade against handle, water against whetstone, light against steel. District Cutlery is the gold standard of knife sharpening when it comes to performance, customer service and value. 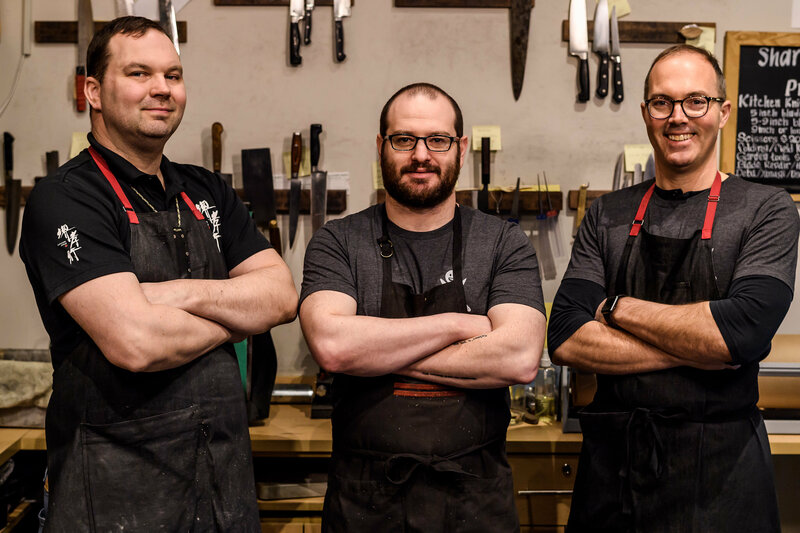 It’s the only high-performance knife shop in the Washington, DC metropolitan area, trusted since 2012 by renowned chefs like José Andrés, Aaron Silverman, Erik Bruner-Yang, Spike Gjerde, plus serious home cooks and outdoor enthusiasts like you. A quality knife will last for generations. Choose the right one, and it’ll be your trusty companion for a long time.